[Review] Is SUCCESS200 a SCAM or REAL Business? By definition, investment is time, energy, or goods spent or purchased in the hope for future improvements and benefits within a specified date or time frame. But how can we tell good investments from bad investments? News about scam investment online is becoming rampant today. 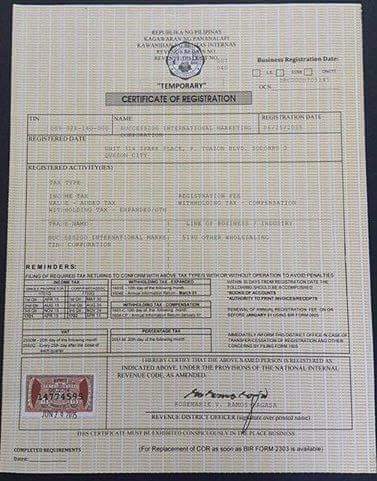 As more Filipinos logged on to the internet, more scam and fake investment surfaced online on social media sites. 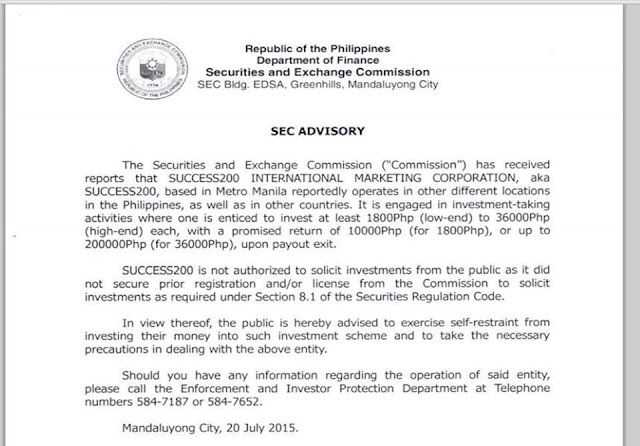 Just this week, July 20 to be precise, SEC has issued an advisory that warned Filipinos from investing their money against Success200. Is SUCCESS200 a fake and scam company then? 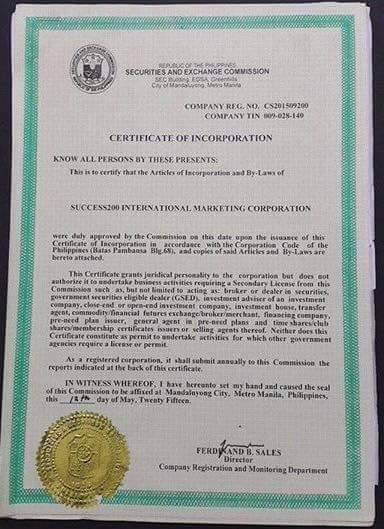 SUCCESS200 a.k.a Success200 International Marketing Corporation is a duly registered local corporation in Securities and Exchange Commission with SEC Registration # CS20159200 issued May 12, 2015. 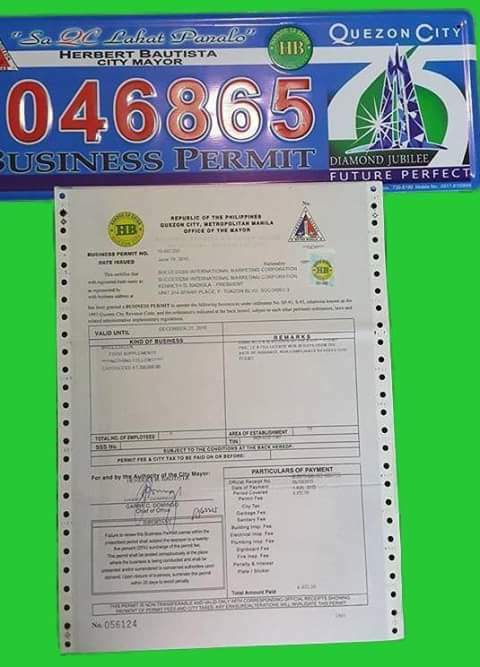 It means SUCCESS200 has licenses, permits, or legalities as required by law under SEC rules and regulations. 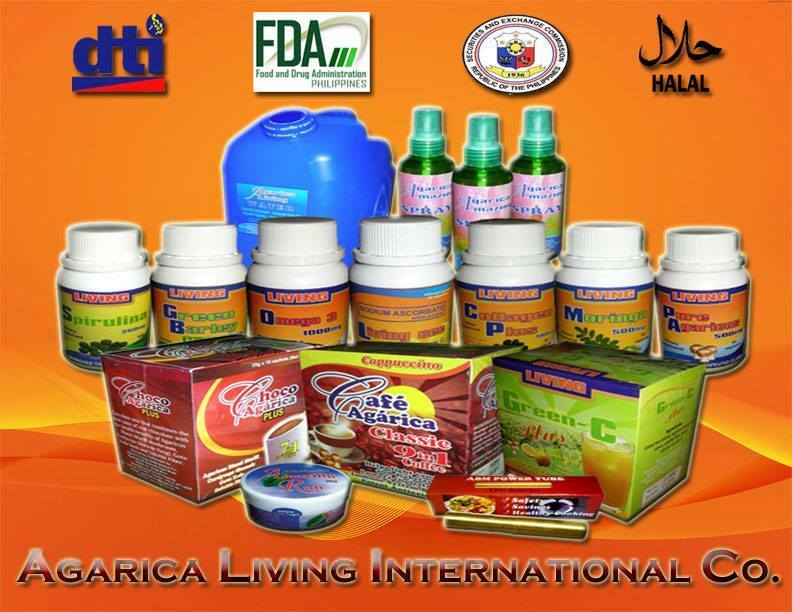 SUCCESS200 INTERNATIONAL CORP. is a 100% Filipino owned legitimate distribution and manufacturing company. It is not an investment company; we do not sell securities or any guarantees. Earnings or commissions are paid base on the production of sales and distribution of products through our unique compensation plan. There is no guaranteed income only the opportunity to earn through the SUCCESS200 unique compensation plan. 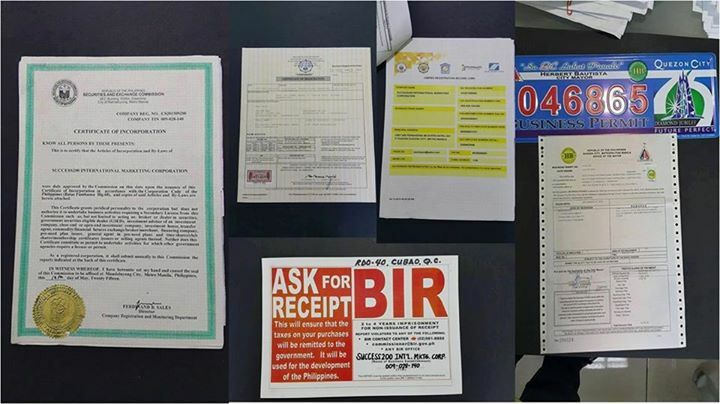 Under R.A. 7394 Consumer Act of the Philippines, consumers are entitled to either an exchange or refund, as long as there is a defect in the quality of goods; the prohibition is not an excuse for the consumer to return the goods because of a change of mind; while consumers have the right to choose and make a canvass of prices, once a sale is done and the product has no defect, one cannot return the goods nor ask for a refund. In no event, regardless of cause shall, SUCCESS200 INTERNATIONAL CORP be liable for any direct or indirect consequential damages or losses of any kind, whether arising from changes in the compensation plan or products of the company to any member-distributor. SUCCESS200 engages in the marketing of different products and not with those sales of securities or any FORM of INVESTMENT. Logical note: Remember, investment is not just for products, but with time and effort too. The company has adopted the so-called sound marketing strategy used in most MULTI-LEVEL Marketing (MLM) industries commonly known as Split Matrix System. Note: I did a search for this networking model, but can't find one. I thought it is common. -_- Instead, I found this, and it makes my brain hurt. Anyway, let it be. Split Matrix System is an innovative marketing strategy approach on how a product to be distributed and promoted in the market for the consumers to earn additional income. Additionally, this system has been used in the MLM Industry for more than a DECADE without any problem whatsoever as far as product distribution and commission payouts are concerned. It is a stable and a proven compensation and marketing plan. Critical Question: Since it is common with some MLMs and been used for decades, does it mean that the strategy is NOT innovative? SUCCESS200 is primarily based on product purchases or sales from the members (commissions). So if no sales of a member, then there is no commission. The company does not guarantee income but only the opportunity to earn income. Compared with those aggressive and quick-rich scheme MLMs, it says there is no guaranteed income. This is a disclaimer. Of course, to make you earn more money, you will work hard for it. But here's a thing, the company stated that members are allowed to create their own strategies to promote the product in which I thought they have "Split Matrix" strategy? Oh wait, maybe I didn't understand well when the company said create own plans they mean social media promotions. Success200 firmly maintain that it is NOT AN INVESTMENT COMPANY. It is purely based on sale production and purchases of goods of the enterprise. Any member that violates company rules and regulations or commits misrepresentations will be terminated from the membership in the company. With that rule alone, why SEC issued an advisory stating like this? Is it the member violates the company's rules? Or the company has hidden its marketing strategy to recruit or solicit investment? 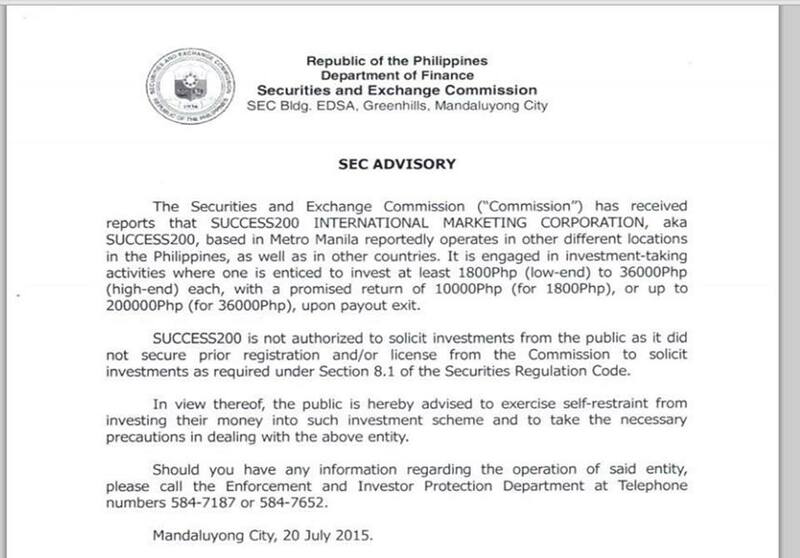 Why SEC received reports about Success200 and issued a statement warning investors that "SUCCESS200 is not authorized to solicit investments from the public...exercise self-restraint from investing their money into such investment scheme"? 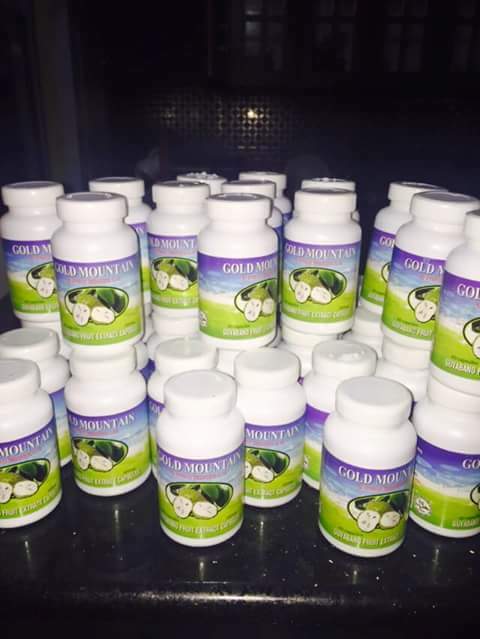 Accordingly, for a member wanted to join the company, he/she NEEDS to purchase a product from Php 1,800 (low-end), equivalent 1 bottle of Guyabano extractor Mangosteen capture, be deposited with BPI Bank or BDO account. In other reliable sources, the company asks investors to put their money with P1,800 (low-end) to P36,000 (high-end), with a promised return of P10,000 to P200,000 upon payout exit, respectively. That’s a “guaranteed” Return On Investment (ROI) of 455.56%, which is unrealistically high. If a member asks about his/her investment, his/her upline will just inform him/her which slot in board level is available. 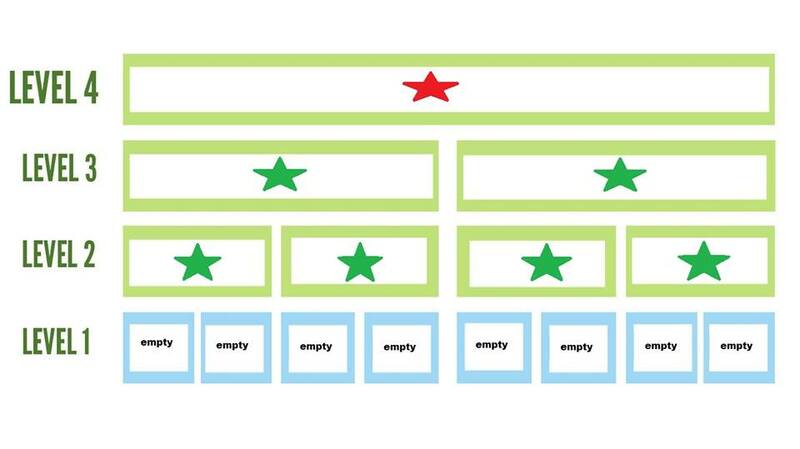 To have a better view, a member posts a table publicly. The first level has 8 slots. One of the slots is yours. And you need to fill those 8 slots so that the Level 2 levels will be pre-filled with 4 orders and level 3 will be pre-filled with 2 orders, and it will level up. 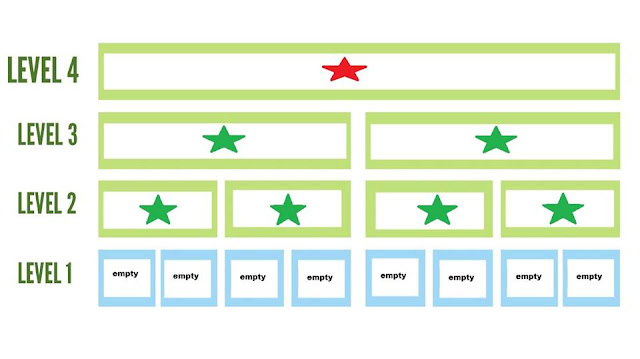 Level 2 will be the exit point in the table of orders and the same time, the earning point. If a member finished exiting in Board 1, it is the end? Then if you ask what about board 2, 3, 4, 5, 6, and so on, a member said no need to recruit two clients because those who filled in board 2 will exit in board 1. How much an individual account earn? If you exit in the first board, a particular single account holder will gain Php 10,000 and another Php 9,000 if you exit in board 2 to 4. 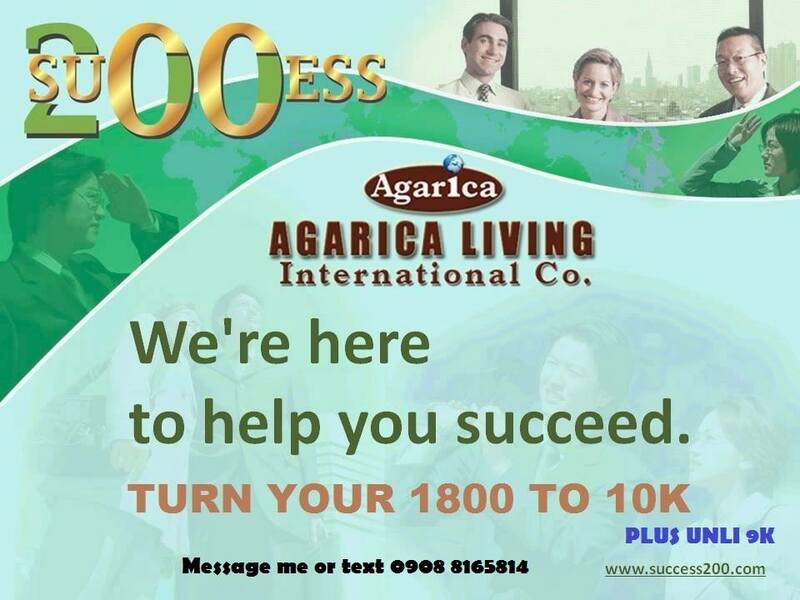 Thus, an investment of 1,800 will have unlimited 9k to 10k every 1-2 months more or less. Tanong: After ko ma REGISTER as CLIENT ni Success 200, ano kasunod na gagawin ko? 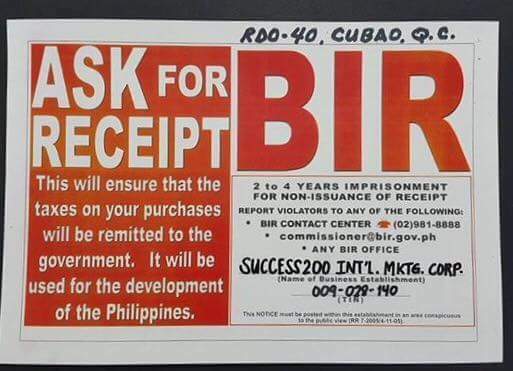 Kelangan po nating tumulong sa pag invite na mga bagong clients. 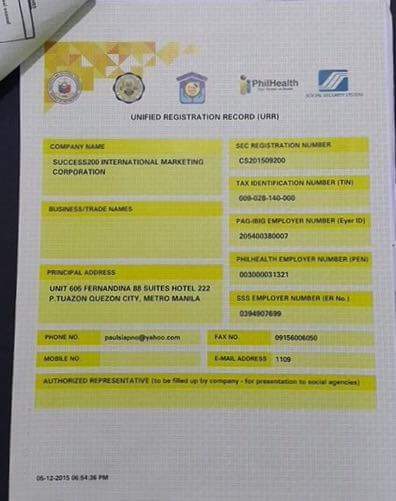 KELANGAN PO MAKAPAG REFER KA NG 2 DIRECT CLIENTS NA MAG JOIN DIN SA SUCCESS 200. Yes, a member should refer two(2), direct clients. Remember, SUCCESS is not an investment company. It is purely based on sale production and purchases of goods of the company. Clearly, this member violates SUCCESS200's by-laws? Or maybe he/she just created its own strategies as statements as mentioned above? How long a member can wait to earn money? It is estimated that when a member exit in the board 1, it will make him/her a 1,000 in one 1 month more or less. Of course, depends on the effort with referring 2 direct clients. SUCCESS200 Legalities? No problemo. The company has a SEC registration, BIR cert, and other permits. In one blog, a particular personal finance coach stating that prospects or other people to Stay Away From SUCCESS200. You can visit the link. 2. Are commissions paid on the sale of products and not on registration/entry fees? 3. Is the intent to sell a product, not a position? 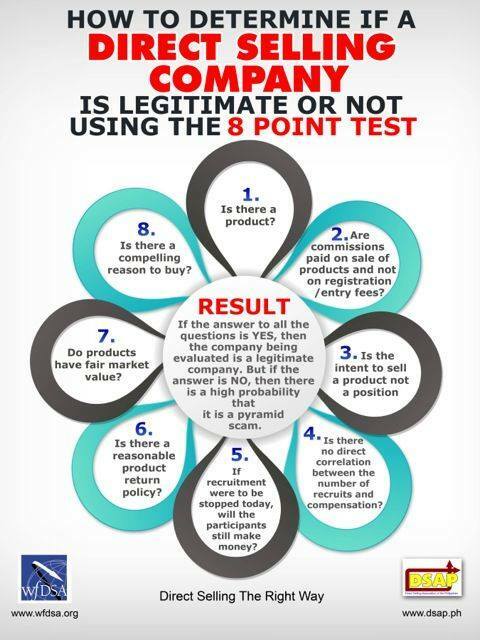 If the answer to all the questions is YES, then the company being evaluated is a legitimate business. But if the answer is NO, then there is a high probability that it is a pyramid scam. Verdict: Is SUCCESS200 real or just good-to-be-true MLM company? You will be the JUDGE. What is your conclusion about this endeavor?